Photo by: Adam Beh. Smallholder farm in Kenya with various conservation agriculture practices. The Land Potential-Knowledge System (LandPKS; landpotential.org), a joint USAID-USDA program, announces the development of a Soil Health module to add to the LandPKS mobile app. Soil health – or the continued capacity of soil to function as a vital living ecosystem that sustains plants, animals and humans (USDA-NRCS, 2018) – is essential in preserving land potential. Soil health is achieved through the practice of conservation agriculture, which includes minimized soil disturbance, permanent living soil cover and diversified of crop rotations (FAO, 2018). Measuring soil health can be done in different ways, but normally includes analysis of the physical, chemical and biological properties of soil. Depending on the type of analysis, this can be determined both in a laboratory and the field. The goal of the LandPKS Soil Health module is to allow users to input and track data about the health of their soil. Soil health indicators are being selected for the Soil Health module based on which indicators have the most significant impact on soil health, which are the easiest to observe and which are most commonly used by different soil scientists globally. These soil health indicators, when observed over time, can provide land managers with critical information about how management practices are affecting their soil’s health. Knowing the effects of management practices on soil health will then allow land managers and farmers to be better informed in order to maximize and preserve the potential of their land. The Soil Health module is being developed by Dr. W. Ashley Hammac. Dr. Hammac holds a Ph.D. in Soil Science from Washington State University and has worked for the USDA-ARS in the National Soil Erosion Research Lab. 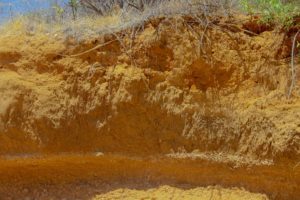 Soil in Samburu County, Kenya. Photo by David Kimiti. The Soil Health module will be a nice complement to the LandInfo module that is currently available on the LandPKS app. LandInfo measures relatively static soil properties, including texture and rock fragment volume by depth. In contrast, Soil Health measures more of the dynamic soil properties that are important for productivity. In combination, understanding both the static and dynamic properties of the soil is incredibly beneficial for the land manager, farmer or natural resource conservationist. The LandPKS app Version 3.0 is free and available in the Google Play Store and iTunes Store. Read more about Version 3.0 on the landpotential.org website. Training resources, including guides and online trainings, are also available on the website. The LandPKS app was developed by the LandPKS Team with support from USAID and USDA-ARS. Please contact us at contact@landpotential.org with any questions, comments or feedback. Follow us on Twitter @LandPKS or Facebook to stay up to date.